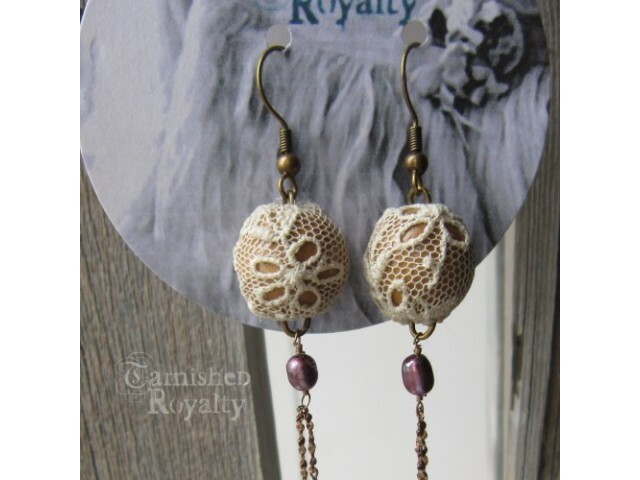 Wood beads wrapped with vintage lace. Turquoise tone magnasite bead and double chain in antique b..
Wood beads are hand wrapped with vintage lace. Silver tone drops are transparent on one side. 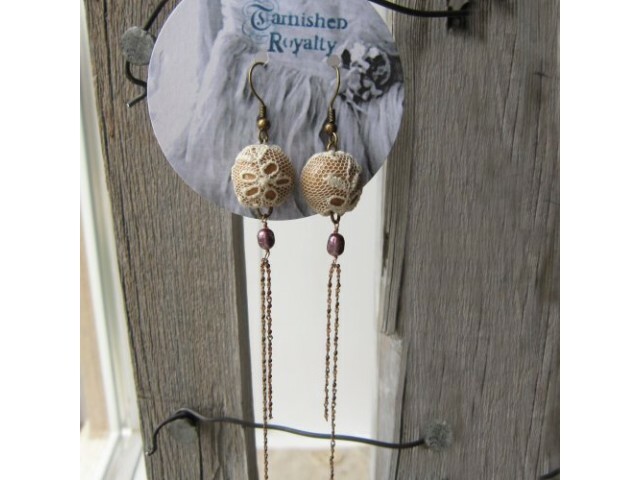 &nb..
Wood beads are hand wrapped with vintage lace, hang from antique wooden rosary beads. 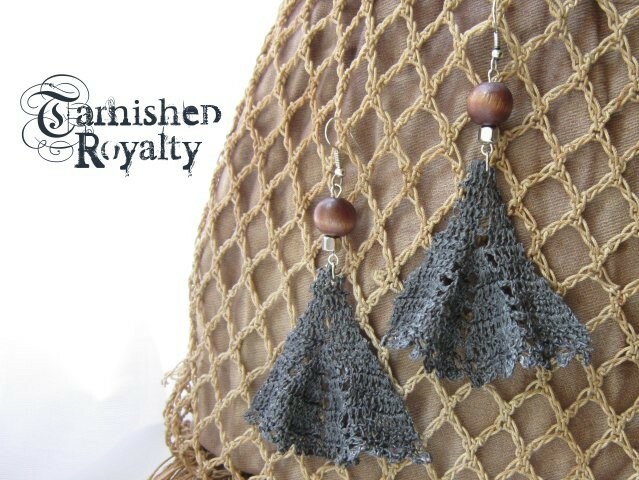 Earri..
Wood beads are hand wrapped with vintage lace. Turquoise tone magnesite drops. 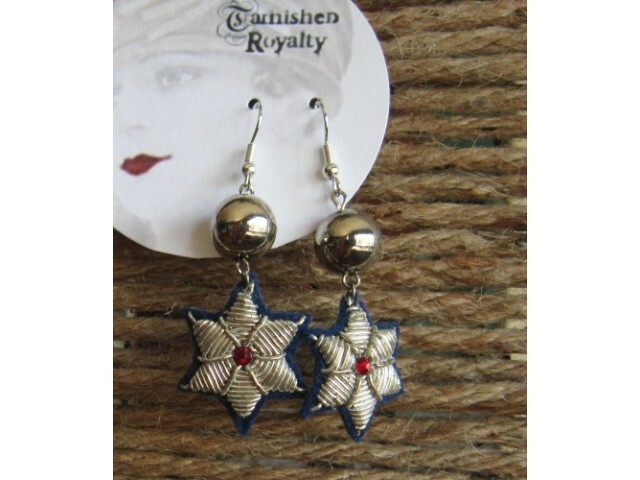 Earring..
Stars from vintage military badges were cut out and upscaled into one of a kind earrings. Em..
Vintage lace flower with a metallic gold bead center, upscaled with double goldtone chains d..
Hand cut leather crosses are given a turquoise patina finish, embellished with tiny metallic gold..
Vintage lace inset, framed by a hammered silvertone chunky cross. 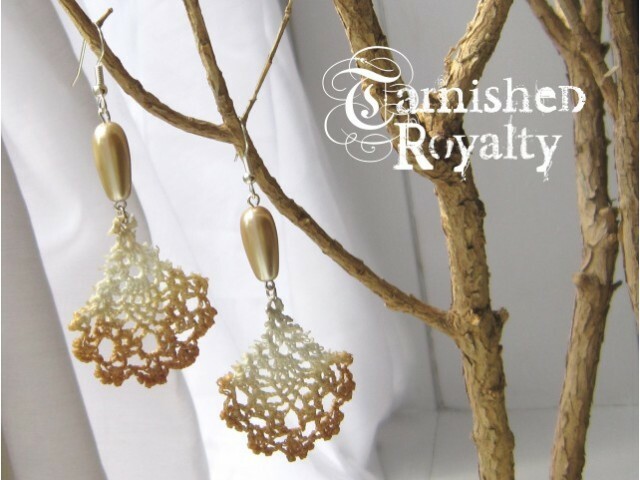 Earrings measure 1 inch from to..
Wood beads wrapped with vintage lace. 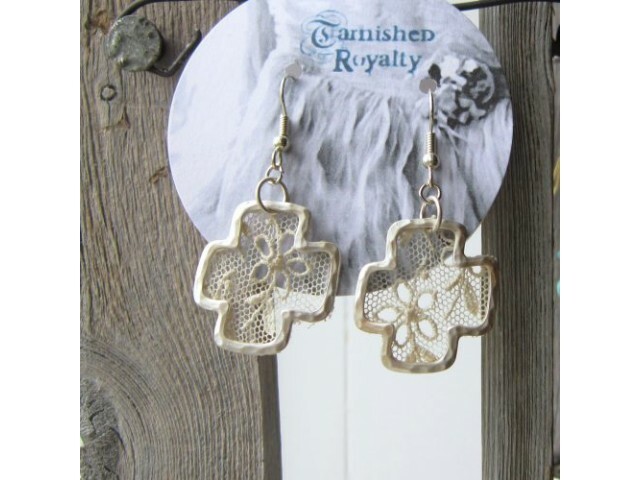 Earrings measure 3 3/4 inches from top of ball to end of ch..
Vintage lace and wire form a cross, embellished with pearls. Earrings measure 1 1/4 inches from t..
Vintage brass anchor button, dyed turquoise chip, double strands gold tone chain. 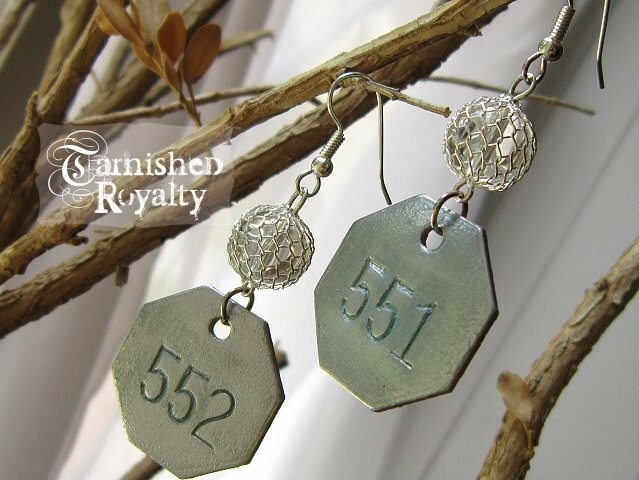 Earrings measur..
Vintage lace repurposed as chic on trend earrings, encircled by pearls, silvertone fishwire ..
Vintage crochet lace gets an ombre tea-dye treatment, hangs from a pearl drop, silver tone fishwi..
Vintage locker tags given a coppery-silver finish and numbers with patina, dangle from a tur..
Vintage locker tags combine with black pearlescent rings, shoulder dusting length, silver an..
Lace hearts with blush dye, Swarovski rhinestone, silver tone fishwire hook. Approx. 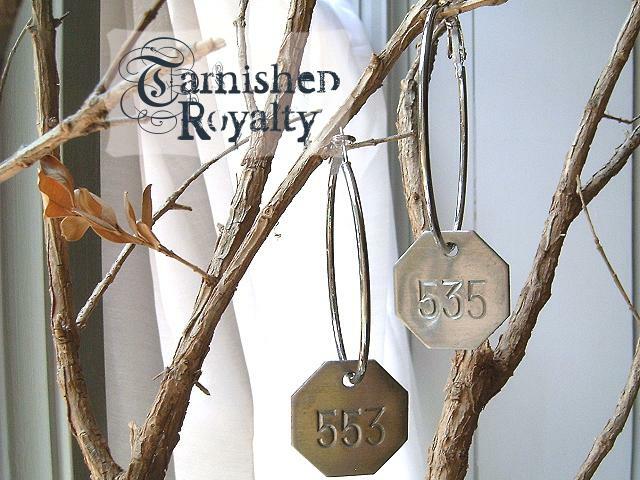 1 1/4 i..
Vintage locker tags are given an antique brass tone finish and red grunge patina, .. 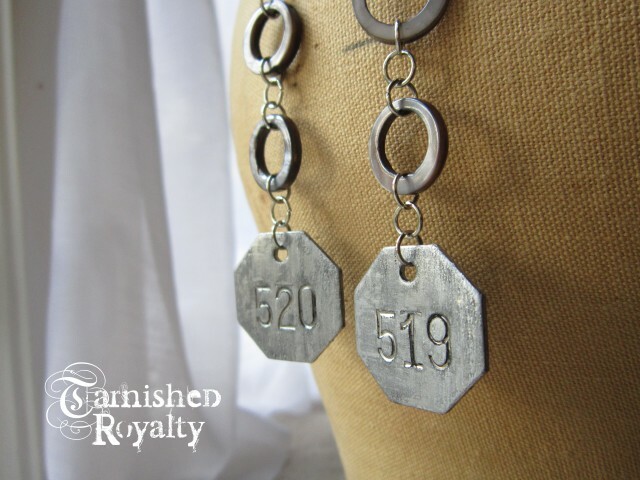 Fanned and flared crochet lace with charcoal gray dye paired with wooden and ..
Vintage locker tags with natural silver finish are paired with silver tone ho..
Vintage locker tags are given an antique brass finish and patina numbers, paired with m.. Fanned and flared crochet lace with gold dye, paired with magnesite, chunky goldto..
Vintage locker tags are given a slight turquoise patina, paired with netted crystal ball,&nb..